Eighty-one-year-old woodcarver and naturalist Bob Spear has birds on the brain  and has since he started crafting them from wood in 1938. Thats when the teen-ager, then living on a Colchester farm, used a jackknife to carve a couple of parakeets. Spear now lives next door to the Birds of Vermont Museum in Huntington  the avian-inspired institution he established in 1987 gets 6000 visitors a year. Its just up the road from the Green Mountain Audubon Nature Center, which Spear also founded. 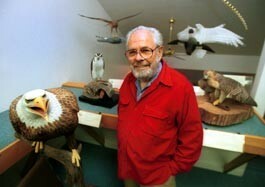 Spear estimates he has completed 445 biologically accurate bird carvings that are on display in Plexiglas cases. Sparrows, meadowlarks, vireos, grosbeaks, warblers, towhees, wrens, phoebes and finches, among others, have been depicted with exacting care, along with an approximation of their habitats. Even the downiest of feathers and tiniest of eggs in a nest look real, but are all made of wood. Large birds of prey that occupy one unenclosed section appear to swoop down on make-believe snakes and rodents. The museums artificial wildlife conveys a thrilling realism. While some people would justifiably boast about these accomplishments, Spear is a taciturn New Englander who tends to understate his own remarkable gift. Seven Days: What on earth got you started carving birds? Bob Spear: My mother, who died when I was 16, was always interested in nature. Im a self-taught birdwatcher and I collected butterflies and moths, but I also was drawing and painting. I learned taxidermy at age 12. After I did those parakeets, I decided that carving birds would be better than trying to make dead things look alive again. SD: What happened to that pursuit as you grew older? BS: I was in the Navy during World War II, working on radar, then I got a job at General Electric in Burlington as a technical specialist. When I left GE in 1972, I got into the environmental movement. Id already started a chapter here of the National Audubon Society in 1962. We started one of the very first nature centers in the country when I negotiated to buy the [Huntington] property from the Hires Root Beer family. I was the full-time director for most of the 1970s. I retired when I was about to turn 60 and started to carve birds for educational purposes. SD: Did you do that with the idea of opening a museum? BS: No. I wanted to give them to an existing organization, but couldnt find one that had space for what was then about 150 birds in their habitats. So I built this structure just as a place to put these things. We opened for members as a nonprofit in 1987. It was a gradual evolution to becoming a museum for the public. SD: Who are your biggest fans? BS: We get a lot of children. We keep small stools they can grab to get up high enough to look into the display cases. We have scavenger hunts they can do with their teachers. This place really catches their attention, even the preschoolers. SD: You began with a simple jackknife. What techniques do you use today? BS: At first it was just knives, chisels and oil paint. Now, Ive got power carving and woodburning tools. I use a woodburner on top of acrylic paint for a richer texture, or just put the burner directly on unpainted wood. I usually work from photographs that have the pose I want, but Ive got a cabinet full of preserved bird skins for reference. The specimens help me find the right colors and measurements. SD: The feathers in particular look so real. BS: People always want to poke them to see. SD: Are there certain types of materials you like to work with? BS: I buy basswood logs at a sawmill. Basswood has a fine grain and no resins that might affect the paint. I sometimes make legs out of plumbers solder because its soft enough to put in detail, but the legs of big birds are copper tubing or steel rods covered with wood. I get glass eyes from a taxidermist. I prefer real nests, whenever possible. SD: What keeps you so devoted to this art form? BS: Its a way of making people aware of whats here. We have to develop awareness so we can actually do something about the environment. Its pretty sad. Downstairs, we have a room with threatened, endangered and extinct species arranged in order of their disappearance: The great auk, in the puffin family, was the first to become extinct in North America in the mid-1800s. Passenger pigeons were last seen in the early 1900s in the wild, in 1914 at a zoo. The Carolina parakeet at about the same time. The Eskimo curlew hasnt been seen since 1960. Theyre probably gone. SD: The museum has such a vast array. Are there any birds you havent gotten around to replicating? BS: Theres about 60 species yet to be done for our wetlands diorama downstairs. SD: Do you have a favorite carving? BS: Usually by the time I finish, Im sick of it. SD: How long does it take you to carve a bird? BS: Maybe 20 to 30 hours for a little chickadee, and as much as 500 hours for a California condor. SD: Is anyone else doing this around the country? SD: Do you ever take a break? BS: I like going to the tropics in the winter. Costa Rica, Trinidad, Belize, Jamaica, places like that. BS: For birdwatching. I dont do any carving or drawing when Im there.